This Feb. 22, 2017 photo shows a U.N. peacekeeper's blue helmet balanced on a weapon in Port-au-Prince, Haiti. The U.N. General Assembly voted Friday to cut $600 million from the organization's nearly $8 billion annual peacekeeping budget. The move comes amid pressure from the Trump administration, which contributes more than a quarter of the department's annual budget. But U.N. Secretary-General António Guterres, who took office Jan. 1, has also called for major U.N. reforms, including in peacekeeping. U.N. peacekeeping, which supports more than 110,000 troops, police and civilians in 16 missions, has come under harsh criticism in recent years for undisciplined troops who have sometimes failed to protect civilians and even sexually abused them. In Haiti, U.N. peacekeepers have been blamed for bringing a cholera epidemic to the island nation that sickened and killed thousands. But despite inefficiencies and problems, the “blue helmets,” as peacekeepers are known for their distinctive head gear, still play an important role in fragile countries where civilians need protection, humanitarian assistance and stable institutions. “It's great value,” said Jordie Hannum, senior director for the Better World Campaign, which works to promote strong relations between the United States and the United Nations. “There is decades of research that shows that peacekeeping, when sufficiently resourced and equipped, can make a huge difference in terms of preventing the resurgence of conflict and in terms of protection of civilians,” Hannum said. U.S. Ambassador to the UN Nikki Haley testifies on Capitol Hill in Washington, June 28, 2017, before the House Foreign Affairs Committee hearing: "Advancing U.S. Interests at the United Nations." Upon arriving at the U.N. in January, U.S. Ambassador to the United Nations Nikki Haley said she would be looking at what is working and fixing what is not. “Anything that seems to be obsolete and not necessary, we're going to do away with,” Haley warned. The United States is the U.N.'s largest donor, contributing about $611 million this year to the regular budget of more than $2.5 billion. Washington also contributes more than $2 billion annually to peacekeeping, and hundreds of millions more to programs, including the U.N. Children's Fund (UNICEF) and the World Food Program. Friday's vote was focused only on the peacekeeping budget, meaning the U.S. will save around $150 million next year, as it pays about a quarter of the peacekeeping budget. Washington had hoped to slash $1 billion from the department's budget, but lengthy negotiations among member states ended with a European Union-proposed compromise of $7.3 billion for the annual peacekeeping budget. Ambassador Haley proclaimed it a victory. “Just five months into our time here, we've already been able to cut over half a billion dollars from the U.N. peacekeeping budget and we're only getting started,” she said in a statement. 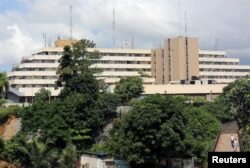 The headquarters of the United Nations Operation in Ivory Coast, which shut down on June 30, is seen at the Sebroko District, in Abidjan, Ivory Coast. U.N. spokesperson Stephane Dujarric told reporters the world body will make every effort to ensure mandates are implemented, despite the sizable budget cut. Several peacekeeping missions have already been under review. On Friday, the 13-year-old mission in the Ivory Coast completed its shut down. That mission had a budget of more than $150 million in its final year. Others, like the massive, decade-old African Union-U.N. Hybrid operation in Sudan's Darfur region, which has more than 19,000 peacekeepers and an annual budget exceeding $1 billion, will see a gradual reduction in troops. In Haiti, that mission has begun a six-month drawdown of its nearly 4,000-strong military component and in mid-October will transition to a police-only mission. 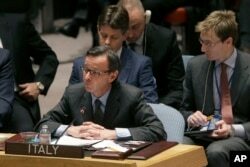 Italian Ambassador Sebastiano Cardi speaks during a Security Council meeting, Feb. 18, 2015, at United Nations headquarters. Several Security Council ambassadors welcomed the cuts, which will translate to savings for all countries that contribute to the peacekeeping budget. But some missions have actually seen an increase in resources, including in Mali, which is on the front line of the war on terror in the Sahel region of West Africa.